If you fulfilled Dr. Wily's parts request last week, any level, you will not get any rewards for doing so this week (if you didn't at all last week, you can fulfill his request and get your rewards this week). Instead, feel free to use this week to remodel cards of your own choosing. Have some cards rusting away in your dusty old trade pile? Dr. Wily is in need of parts for his robots and experiments, and your cards might be the thing he's looking for. Dr. Wily's Remodeling Lab is a game where you can take 2 old cards and turn them into 3 new ones! Fulfill Dr. Wily's parts requests once a round and you can earn up to 2 extra cards, for a total of 5 cards! Each week, you can hand Dr. Wily two random cards and see what you get in return. Work within his rules of remodeling, and he'll be more willing to give you certain cards back, or work to fulfill the different levels of Dr. Wily's parts requests to increase your return. You're free to play however you like! But the cards you get back won't ever be completely random; they'll always be based on the cards you give to him! This round will close on July 14th. This round will close on June 30th. This week, I'll try something new for Switch It Up! For the chaos pile only, you are allowed to do multiple switches this week! However, there must be a minimum 48 hour gap between your switches. This round will close on June 16th. This round will close on June 2nd. This round will close on May 19th. This round will close on May 5th. This round will close on April 21st. Week Two of Dr. Wily's Remodeling Lab Round 30 is here! Round 30 will close on March 28th. This round will close on March 28th. Week Two of Dr. Wily's Remodeling Lab Round 29 is here! Round 29 will close on March 13th. 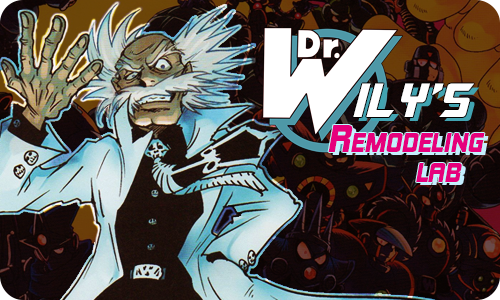 Week Two of Dr. Wily's Remodeling Lab Round 27 is here! Round 28 will close on March 2nd, but the new round will be posted on the 26th to get back on track. This round will close on March 2nd.